The Fourth of July is typically near the top of everyone’s favorite holiday list, and to be honest, how could it not be? It’s in the summer where the popular traditions include parades, fireworks, barbecues, baseball, beaches, all the while sporting red, white and blue attire (the more ridiculous the better). Independence Day strikes a beautiful balance between fun and enjoyment and the spirit of a really serious occasion: the day our Founding Fathers put their lives on the line by signing a document that represented the freedom of our nation. Now, your run of the mill history buff (I consider myself as amateur buff status, but I’m working on it) would be quick to point out that July 4, 1776 is the day we declared our independence, not the day we won our independence, which didn’t occur for another seven years. In fact, 1776 was an awful year for the colonial forces, and George Washington himself was beginning to doubt whether they could overcome the world’s most powerful army until the tail end of the year when the momentum began to shift. Ok, sorry, back to the post. A question lingers out there that everyone seems really divided on: how should the church relate to America? A microcosm is this: how should the church celebrate the 4th of July? If you want to cut this reading short and get back to BBQ preparations, it can be summed up like this: deep gratitude without idolatry. The sad irony is that it’s possible (and increasingly common) to disrespect your country with the very freedoms that many men and women before you have risked their lives for you to have. Take a moment to reread that sentence. There is a contemporary bias (see: snobbery) that assumes we deserve that kind of freedom without ever considering the cost that others put forth for us to get it. Anybody in America right now has to, on some level, acknowledge that we are fortunate to be where we are, when we are. For someone to not acknowledge that doesn’t mean it’s not true, it’s that they lack an awareness of reality. Does deep gratitude mean you never have an issue with decisions that are made, leaders that are elected, or policies that are enforced? Of course not, but here’s the thing: in America, you can do something about it. You have a voice, you can take action without fear of being imprisoned for speaking out. 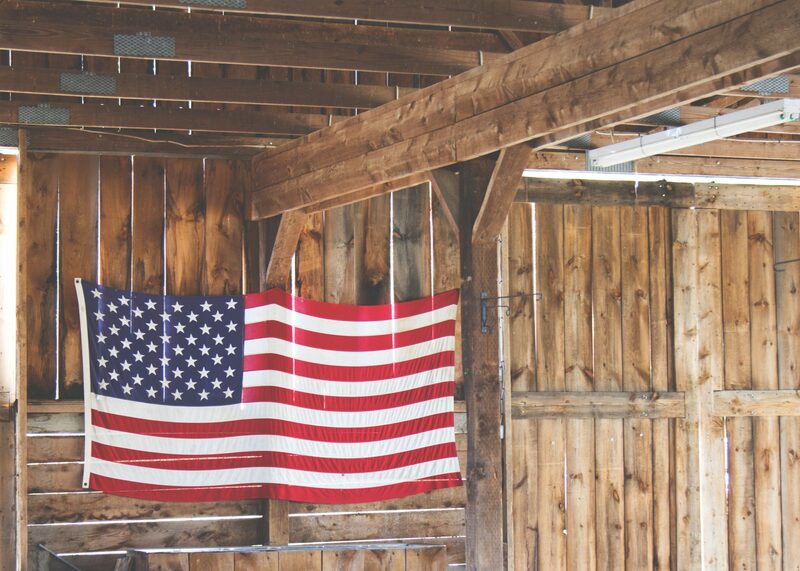 The American flag should stir emotion within you because it’s this flag that is stitched on the uniform of every solider that is currently deployed to ensure you will continue to enjoy the freedom you have. So, the church should show deep gratitude that it exists within the borders of a free, democratic nation where it has no fear of someone kicking the door down to shut things down and imprison the pastor. A lack of gratitude for the United States of America and the founding fathers who penned their name on that document back in 1776 is a failure of the church to count the cost. The other way to get this wrong is to worship the nation and ideals of America to the point where it’s hard to distinguish what you love more, the flag or the cross? There can, once again, be this contemporary bias (see: snobbery) where people view America as the new Israel, as God’s chosen people who He needs to accomplish his mission, as if the celestial city in Revelation is really just a gold-plated Big Apple. Now, let’s be honest, no Christian or church will say they worship their country, but judging by their actions it would seem less clear. There’s a difference between affirming that God is sovereign over every world leader (which he is), and identifying a man or woman to be “God’s candidate” through whom he will deliver a nation from the jaws of destruction. If we’re going to be Biblical, “God’s candidate” is everyone who ever held a leadership position, dating all the way back to Pharaoh in Egypt, for no one comes to power outside of his sovereign control. God doesn’t make mistakes, and he doesn’t stay away late on Election Night biting his nails wondering who will win. God will accomplish his purposes through the church in any and every country he pleases. So church, let’s shy away from draping the flag on crosses, let’s shy away from singing patriotic hymns, and let’s not associate any one man or woman on such a pedestal that should be reserved for one and one only, Jesus Christ. In the letter of 1 Peter, the apostle is writing to churches on how they ought to relate to the world around them as “elect exiles”, believers who are here temporarily but are citizens of another, out of this world, kingdom. “Be subject for the Lord’s sake to every human institution, whether it be to the emperor as supreme, or to governors as sent by him to punish those who do evil and to praise those who do good….Honor everyone. Love the brotherhood. Fear God. Honor the emperor.” 1 Peter 2:13-14, 17. First, be grateful for a country that punishes evil and rewards those who do good. No nation will do this perfectly, but in general, government is a means of common grace that God deploys to rule the world in such a way where the gospel is free to spread to all people. People should resist the government if it fails to do what God intends – punish evil and reward good, but almost any government is better than no government at all. Second, while we are to honor our government and the country we dwell in, and do so willingly, we are called to fear God alone. God is the only one that we show reverence to, who is worthy of our worship and ultimate loyalty. Peter shows us in these verses that it’s important, indeed vital, for the church to strike the tension of deep gratitude without idolatry, and the mission of the church hinges on our ability to get this right. As you take off work, watch the parade, and identify the grillmaster for your barbecue this year, be sure to take the time to acknowledge the reason why you’re doing all that in the first place. Show deep gratitude for the freedoms you have been given, and to those whom help secured those freedoms. And at the same, be sure in your heart that there is only one God that is worthy of your worship, the one who sent His Son to the cross to secure spiritual freedom that will last long after the United States of America ceases to exist. Honor your country. Fear God. And enjoy that watermelon.